For all tillage and row crop establishment methods, Kubota offers proven technology. Today Precision Farming has become more and more important. With GEOCONTROL and GEOSEED® Kubota offers two applications for the PP range that maximise the machine output and prevent double seeding. Even in total darkness your seeding results will be exceptional. 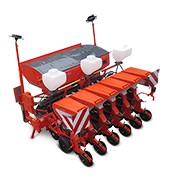 The PP models can be used for standard or mulch seeding (depending on optional equipment). The PP series is available with working widths from 3.00-6.00m with flexibly adjustable row widths and a wide range of additional equipment.